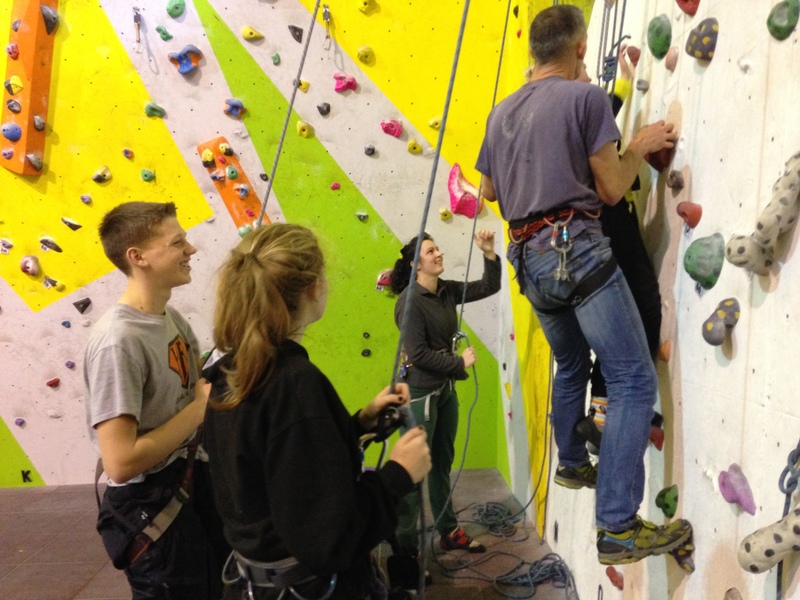 Ok, here’s a post that isn’t about climbing. Typing on a train to London. 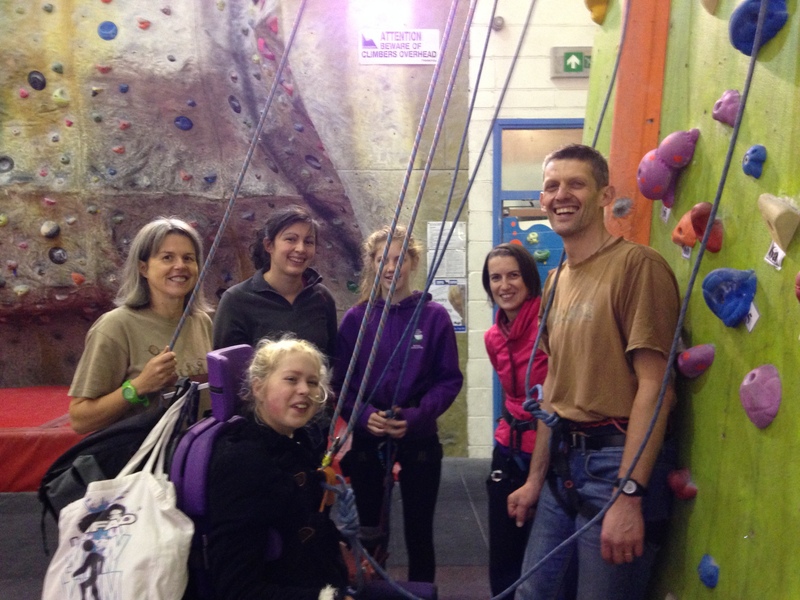 With Clare, climber extraordinaire, and the lovely sisters too. CLIMBING!!!! WE STARTED A CHARITY!! 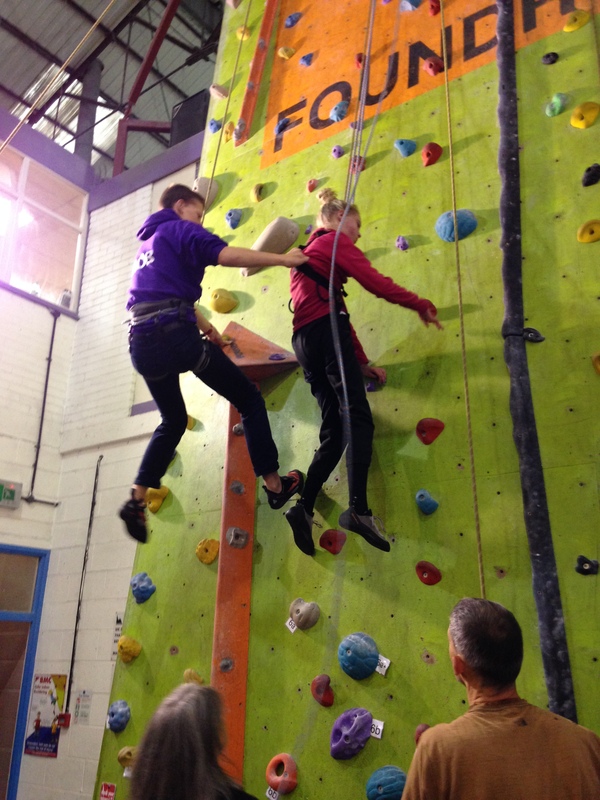 check out https://climbingforallsheffield.com, better still our Facebook page https://www.facebook.com/cfasheffield/ , and see the amazing bunch of climbers and volunteers we get to meet at club sessions. So, London is a bit of an adventure. How does wheelchair travel work out? 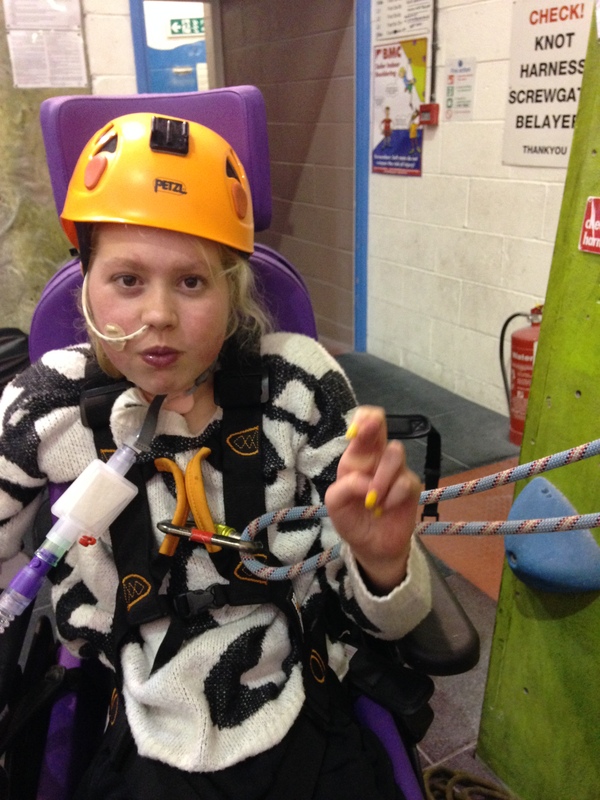 How can Clare survive a day without the usual health props of supported standing, nebulisers, etc.? WHATEVER! Try new stuff! We wanna be out there, living it. 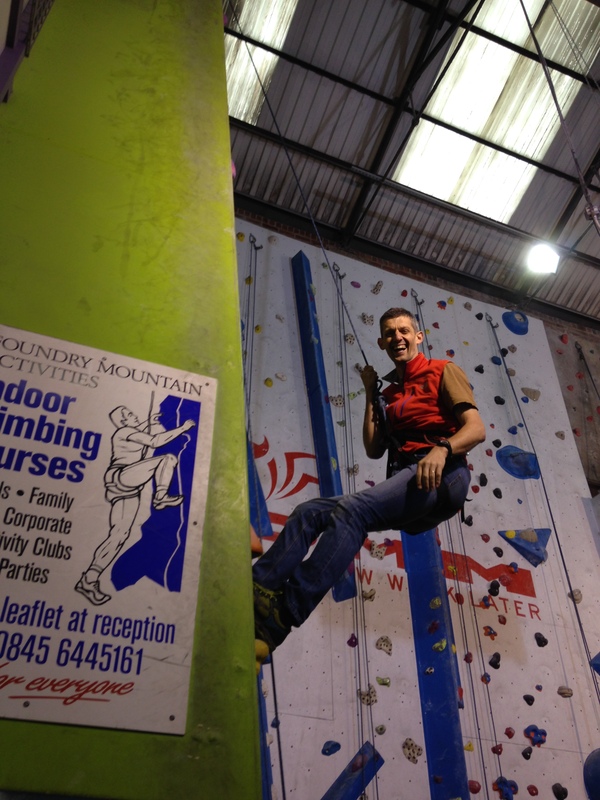 Climbing gets you in the mood to Go For It. The dog isn’t in favour of rest of family making a train journey. So far so good. Parking for Wheelchair Accessible Vehicle at Sheffield station: check. Lifts to platforms: check. Friendly traveller insisting we needn’t lift chair into train: check. Prompt arrival of long & robust ramp: check. There is space in Coach A for one good sized power chair but we’ve left Clare’s drag-it-anywhere manual chair parked there & got Clare to wobble down the narrow gap to seats. New bits of London Underground are accessible but having checked out the (in)accessibility London Tube map (http://content.tfl.gov.uk/step-free-tube-guide-map.pdf) we knew that the four stations near the British Museum are impossible. Nice walk from St Pancras though – flat & kerb-free, and a leafy bit through Russell Square. And the BM is great. Yup. All that history and inspiration. Visible from 3 foot off the ground and in a wheelchair, even the Rosetta Stone. Also big interior spaces, eating & drinking, excellent book shop amongst the gift shops, and spacious accessible toilets. Gave it 5 stars on TripAdvisor, though it would be good if they put in a Changing Places toilet so that people who can’t hop out of their wheelchair can do a full day at BM. Back to good ol’ St Pancras, via MacDonalds to keep the rest of party happy. A member of station staff spots us & asks where we’re going…finds ramp…. full train but we swap our seat reservations to sit in and around the wheelchair space. “But we’re sitting in Priority Seating…”, say the sisters. “You are priority people!” say friendly co-travellers. Hey, the journey was too easy. Tate Modern next time. 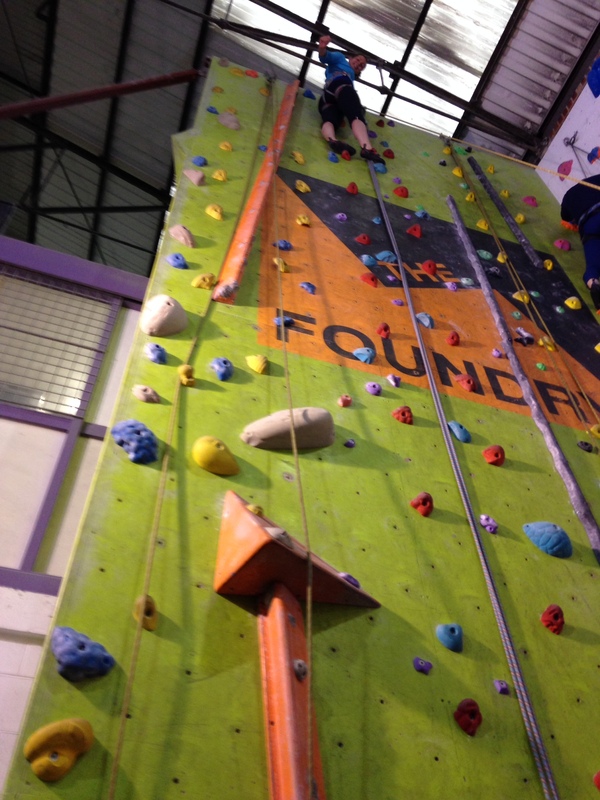 And back to climbing for the next challenge!! 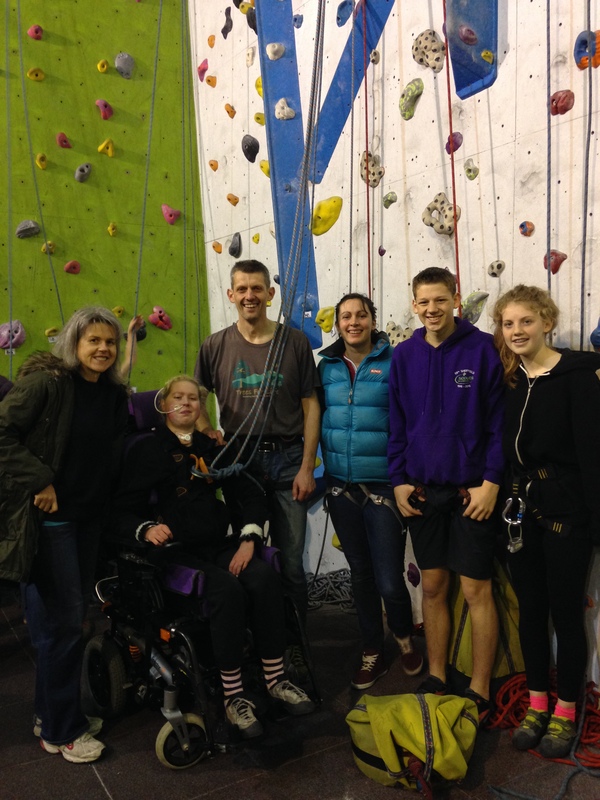 When we arrive we find Nick on the wall, and Helen and Hazel below. Where’s Robin? 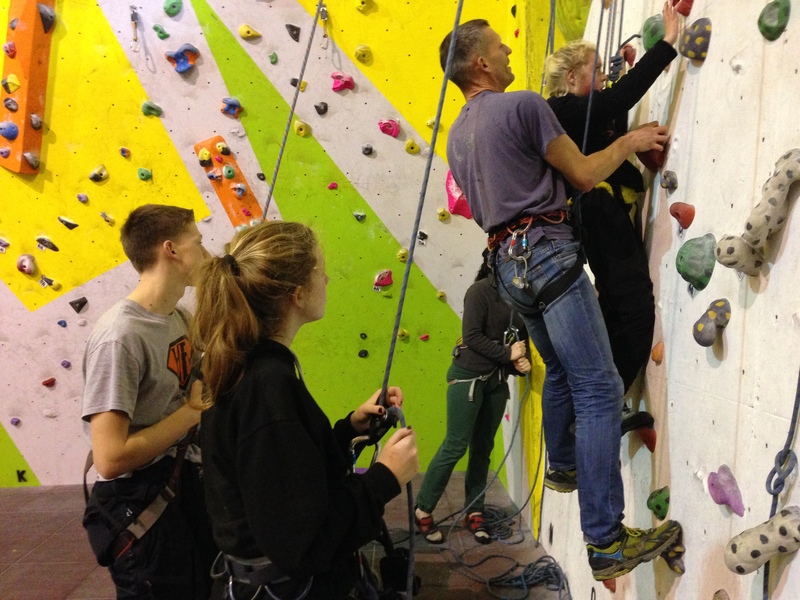 Nick says that his German friend is over, and a bunch of friends are round … they wanted to come climbing this morning but Nick reckoned that would be “too much going on”, so they’ll be climbing this afternoon. 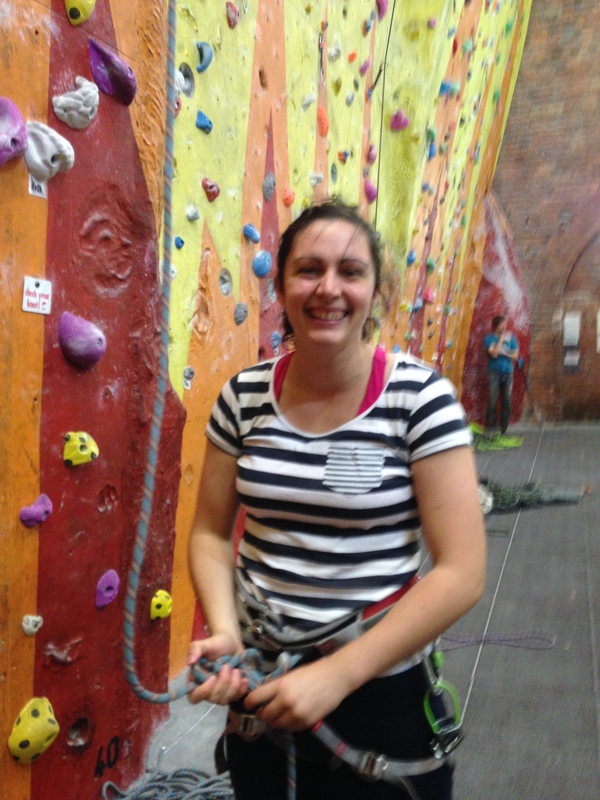 Clare is going to climb near the entrance, where the wall is slopey like the Slab. There are nice shapey red holds. 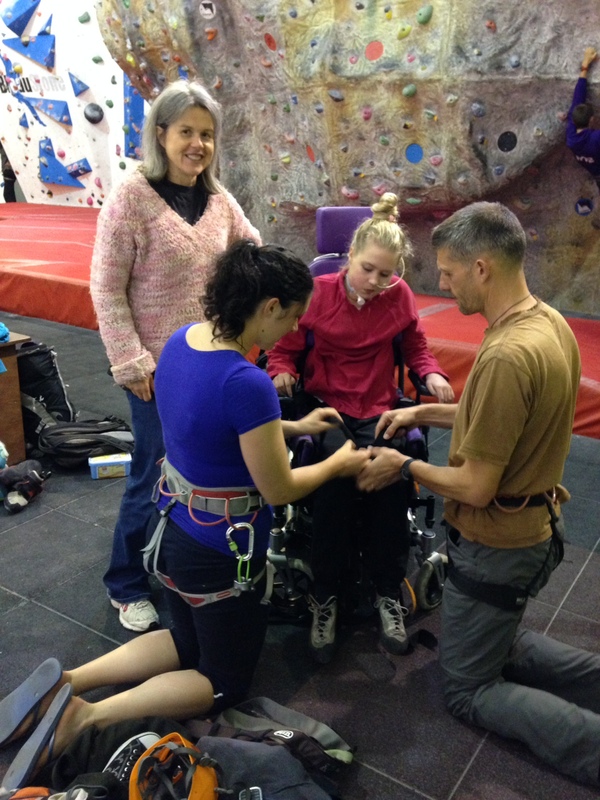 Nick and Helen help Clare into the harness: I hang back, because helping Clare stand doesn’t really have to be a mum role. “What’s the strategy?” I ask. 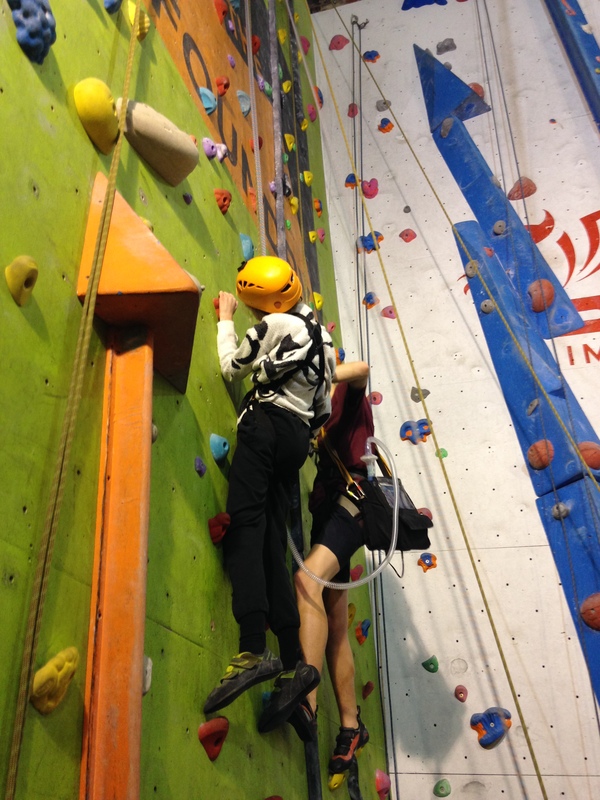 Nick reckons Clare is reaching well for hand holds now & should look down to find foot holds as well. 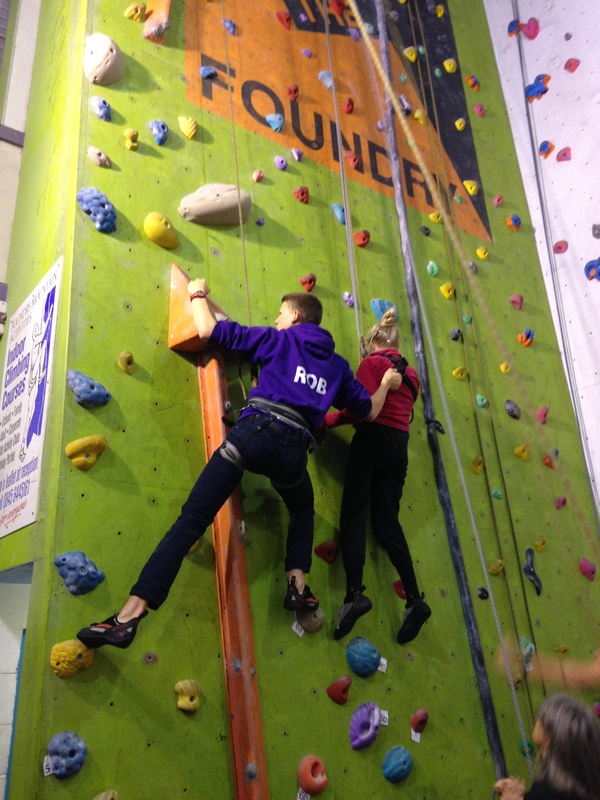 First climb. 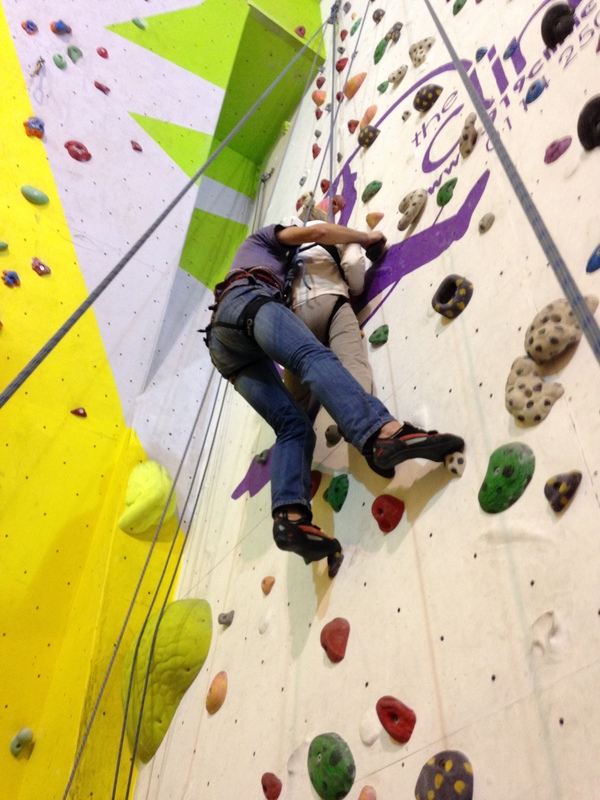 Seeking hand and foot holds goes well. 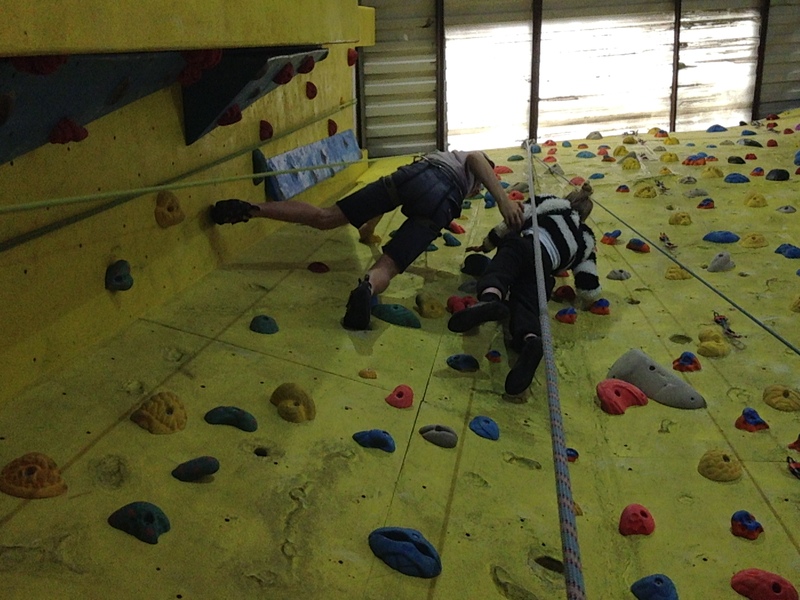 And Clare pushes up from her feet. But she is leaning back a lot. 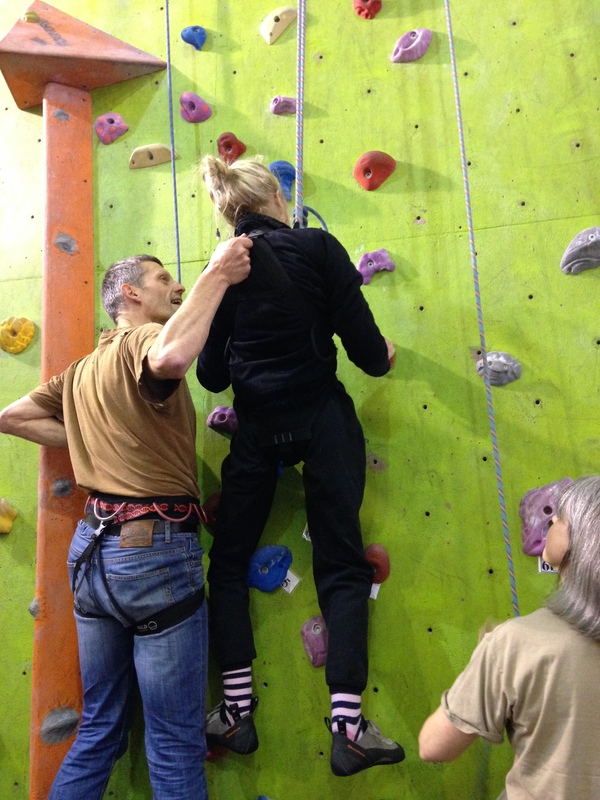 Doing a stand with Nick was fine but it meant the Nick & Helen combo for putting the harness on wasn’t so effective. Clare’s neck gets tired. 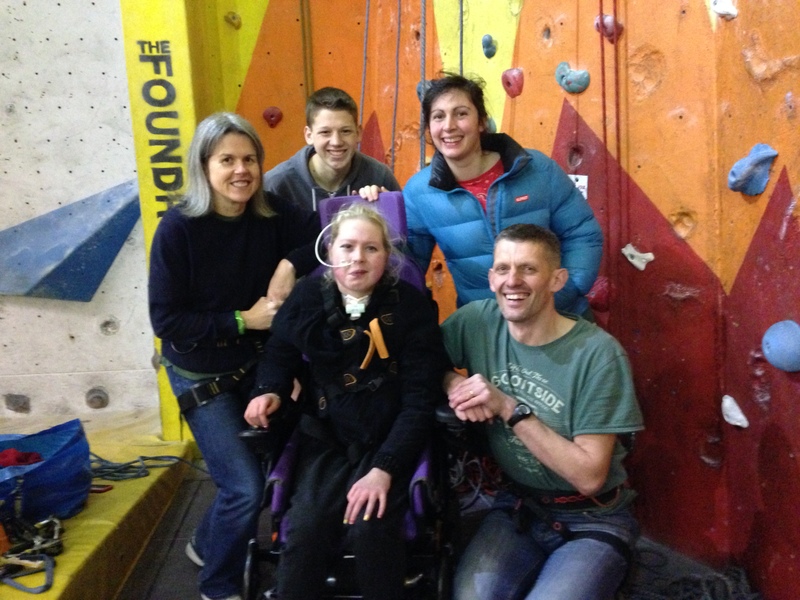 Clare rests and we chat to Annie from Kelford School. 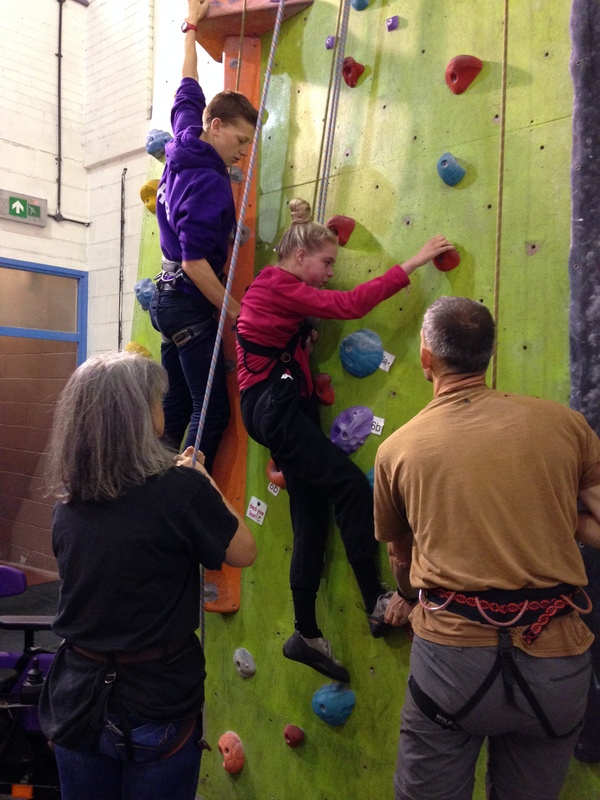 This is the school attended by the three soon-to-be climbers – who will be the first from Kelford, as the other students are from Hilltop School. The harness is much better. Clare keeps going. Hands and feet are impressively still in action. Clare’s forehead is crinkly with tiredness but she’s still smiling. I wonder about another climb. Clare asks is there is going to be a “cake break”. Heh heh, yes, there can be cake. 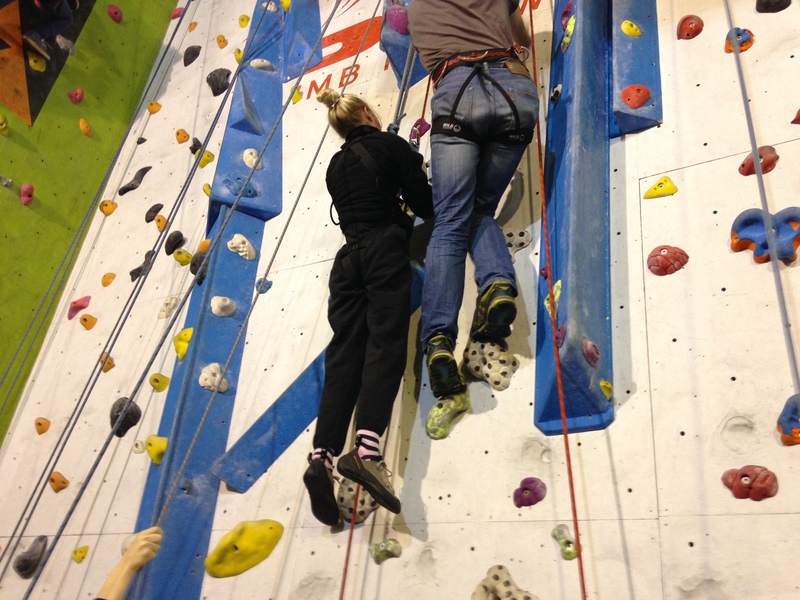 But Clare should be done with climbing first. 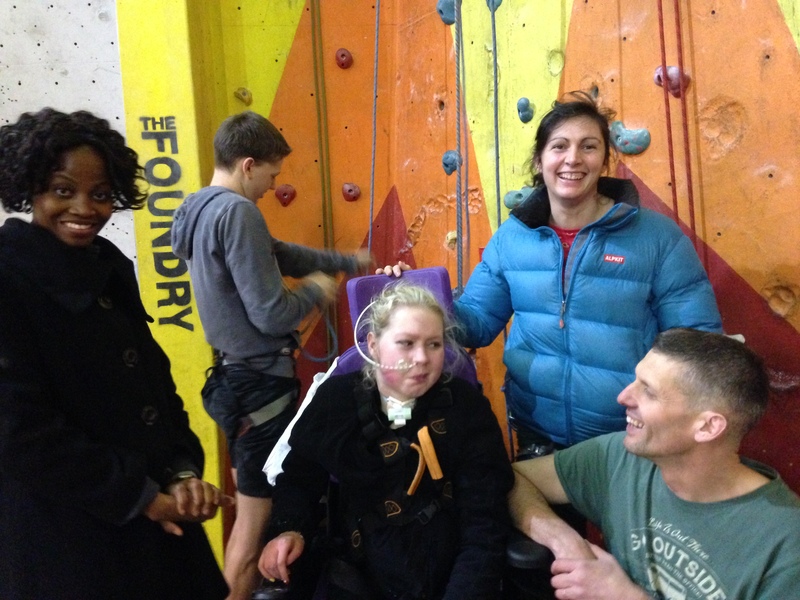 Clare rests while carer has a go at climbing, followed by the entertaining family duo, Robin and Hazel. 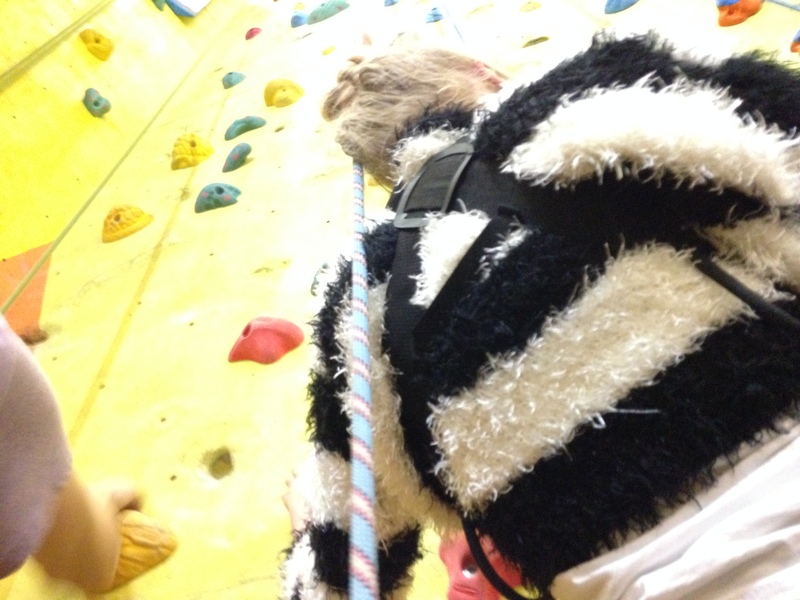 The third climb is not so high. 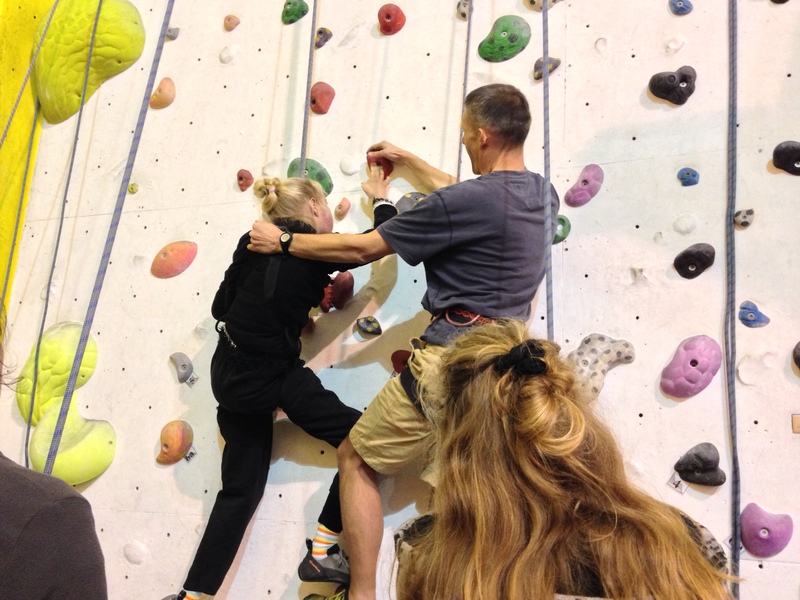 But it goes well – Clare has learnt the patterns of the first few red holds. Group pic taken, then Hazel & I go to fetch coffees and a couple of cakes. Two Sundays ahead looks a good date but we decide on next Sunday evening as Clare is improving fast. Keep up the momentum…. Next time we meet over at the Slab near the nice Reds. Clare and I had been wondering if Robin would be there today, and he is … and Hazel too, on the wall when we arrive. Half term is all but over and everyone has tales to tell. Clare says that Paloma Faith had been amazing live, and we’re expecting some Whittaker adventure tales from the family trip to Norfolk and from Robin’s German friend’s visit to Sheffield. “Have a nice time with your friends last week?” I ask Robin. “Yes, went cycling in Greno Woods”, says Robin. He starts talking about the 12 foot drop. Lasse from Germany ran the drop first – straight over. “Woo, sounds scary”, I say, not yet realising where this tale is going. “What, the new bike, trashed? !” I ask in dismay. Robin is still giving details of the wipe-out, like ‘scorpion-flip’. “My god, was his back hurt?” I ask, horrified. “Luckily not. He was unconscious though. Another friend phoned an ambulance. I went with him to Sheffield Children’s Hospital.” Robin now gets out his mobile and shows us an x-ray photo of a spectacularly broken collar bone. I ask who phoned his parents, and Nick said that had been his job, along with (later on) collecting the bikes. Robin and Nick add details about the hospital stay … very tall 15-year-old with feet hanging over end of Children’s Hospital bed. Luckily sent home after couple of days. Wow. That was some half-term. Not good. So the family didn’t actually get to Norfolk? Apparently they did, later in the week …. and saw some seals, says Hazel. Time to get cracking on a climb. Clare isn’t really 100% today. 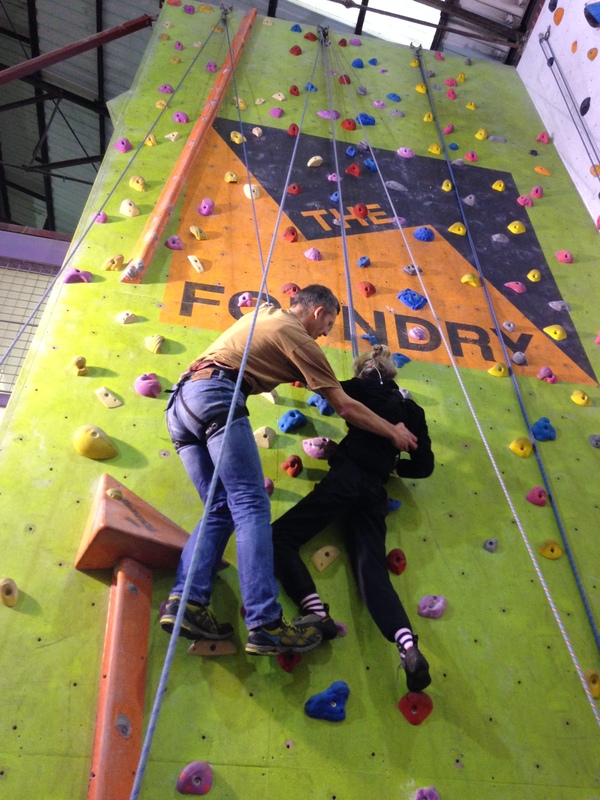 I’d wondered whether to cancel, but she was certain she still wanted to climb. Her voice is fainter today. She’s been having some worse nights and ending up on oxygen, though it’s probably just a minor cold. 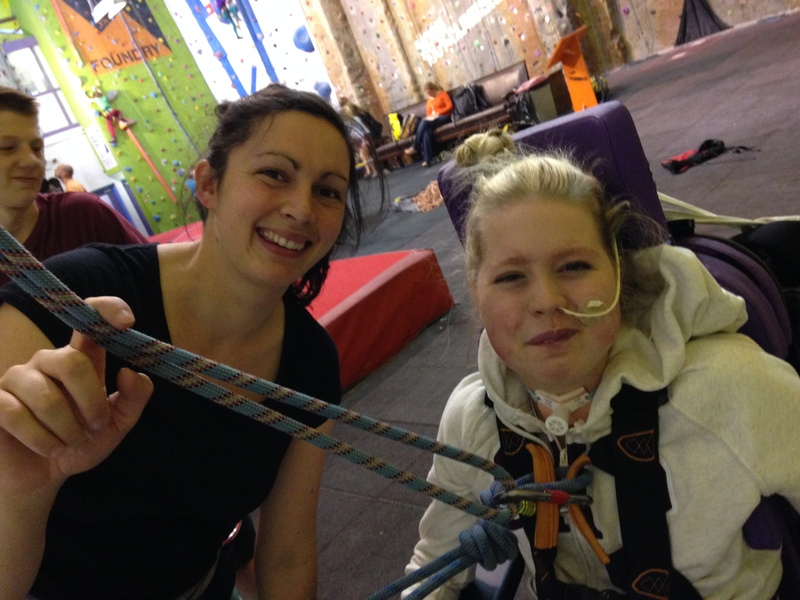 Nick says Robin and Helen can do safety and pulley ropes for Clare, and he’ll climb, with Hazel belaying for him. 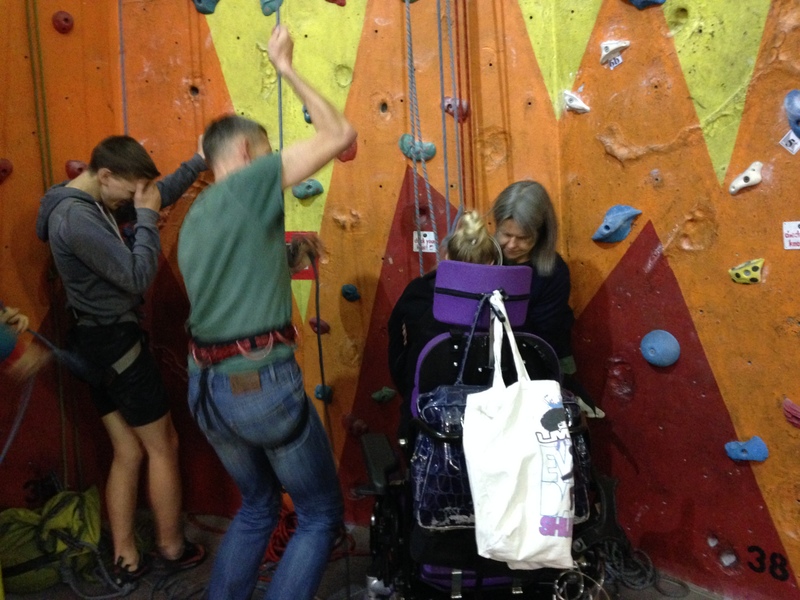 There is a quick trial of the ropes … Hazel has a sandbag to counter the weight difference and we laugh because it nearly lifts. 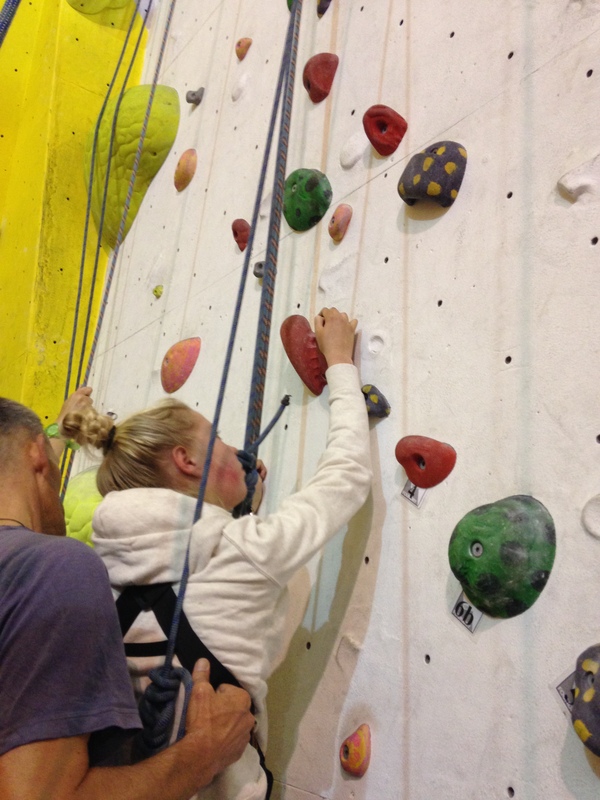 First climb. A good effort with hands and feet. 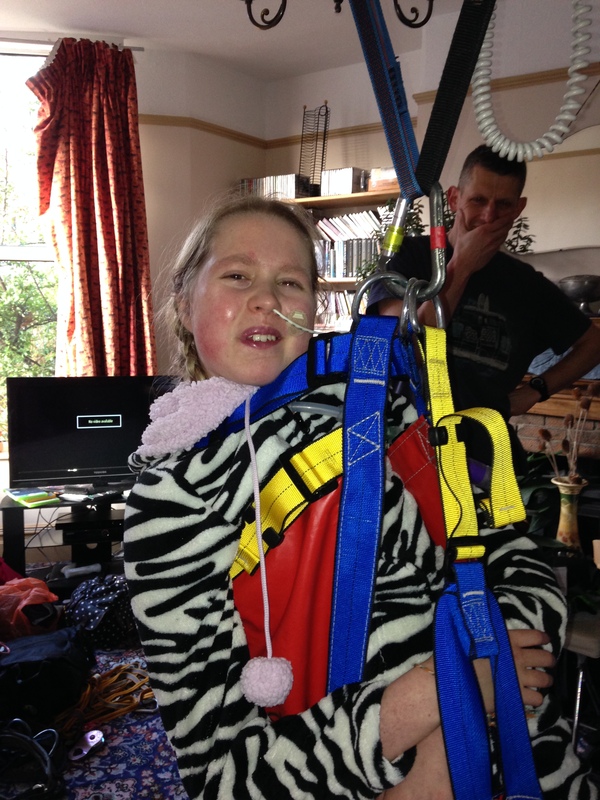 In the rest, Hazel belays for Robin, who wants to climb without hands. Just elbows maybe-? Nick tells him to use his hands because he doesn’t fancy any more time in A&E. Robin allows himself to hold the “smears” with his hands. The second climb gets off to a good start. Good use of feet to push up. There is some “One more!” going on. Clare still looks happy to keep on pulling though. She gets higher than on the first climb. What a superb foot push. It’s Clare who says “One more” at the end. Afterwards we agree it’s certainly been a worthwhile effort, even without Clare on top form. 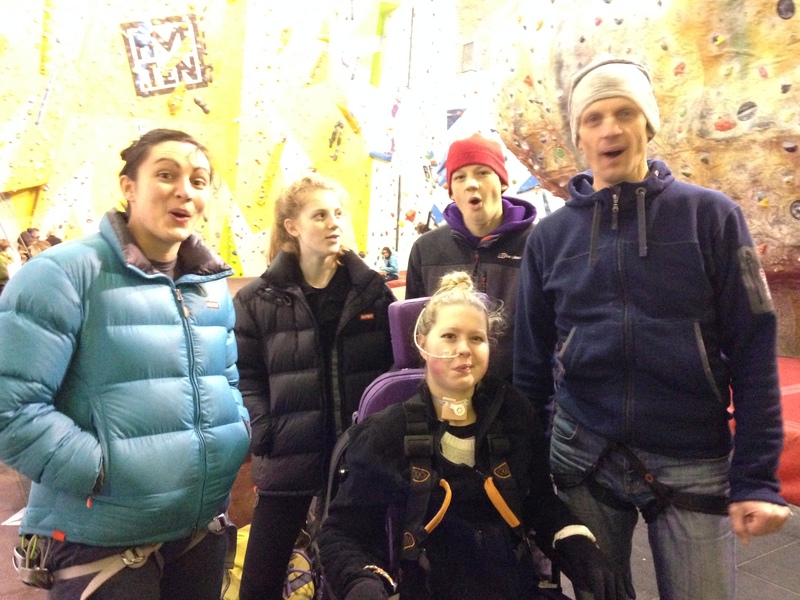 Robin nips up the wall opposite on auto-belay, then belays for Hazel and Helen, who climb interestingly numbered routes. Term starts tomorrow (“I can’t wait”, says Clare). 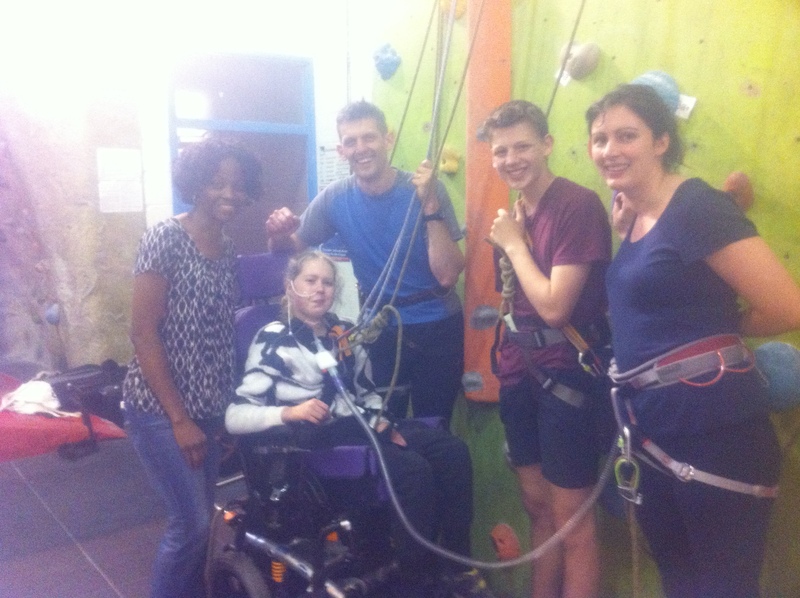 The 3 wheelchair users will have climbed twice by the time we next meet. See you in 2 weeks! 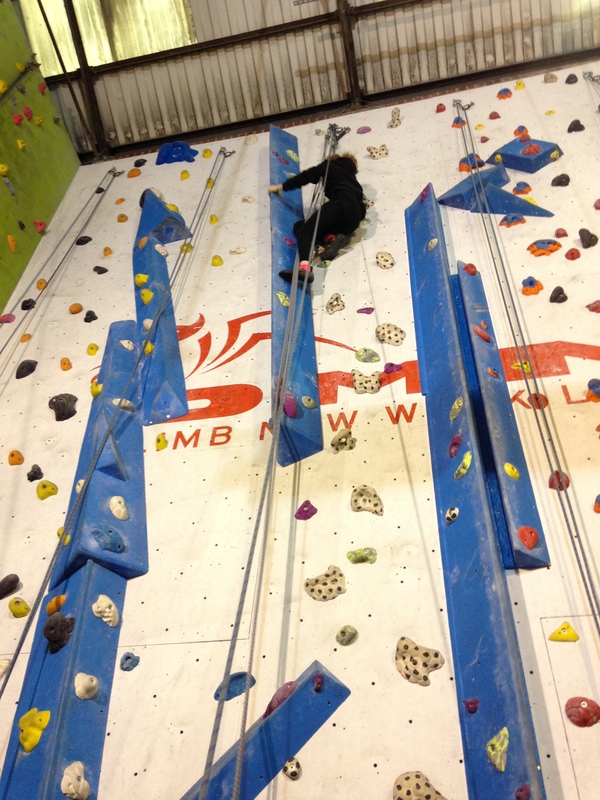 Woo, 3 climbs over the summer months – gotta catch up on this blog. Picture fest coming up … ventilator ducking out of sight … and in the background some huge, dark mountains. Late July, it was back to the Furnace. Not been there since Clare’s 2nd-ish time at The Foundry. It was more of a Fridge in the winter but now it’s hotter and Nick has got a big fan blowing air near our corner. Clare says it’s not hot, and certainly her hands aren’t warm. The conversation starts with dogs. The Whittaker dog is old and very poorly. A lovable dog, from the pictures that Robin shows us. 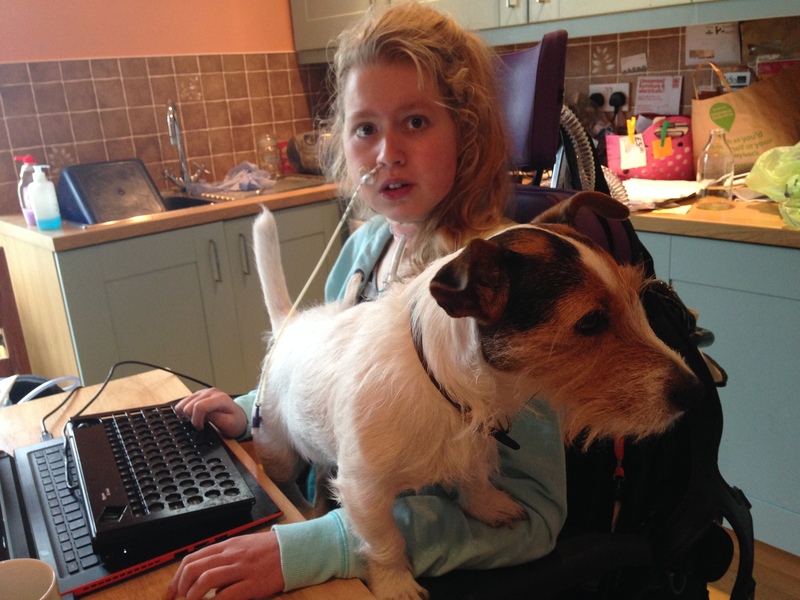 Then we look at pics of Helen’s mum’s sociable labs and whippets, and then show pics of our Pip trying to sit on Clare’s lap while Clare tries to use her laptop. 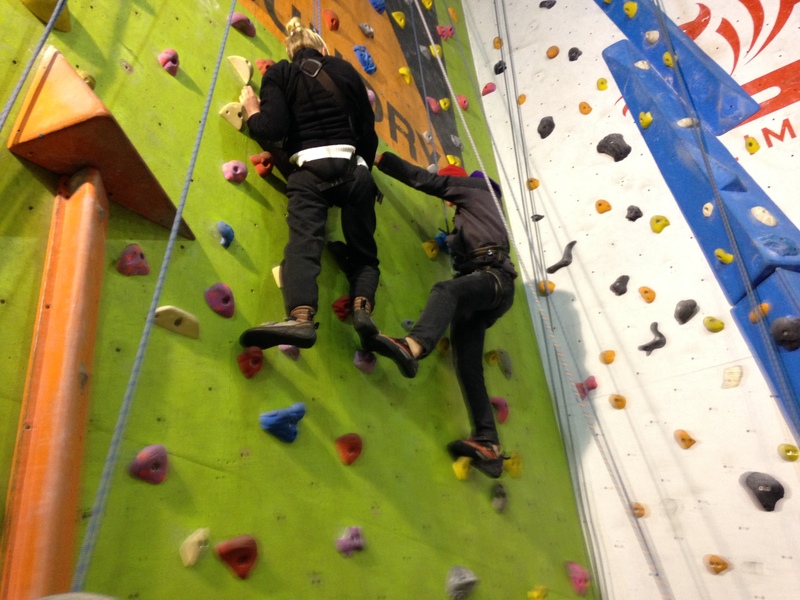 We discuss the climb. Nick has weighed the climbing helmet and a cycling helmet, and the climbing helmet is actually lighter. 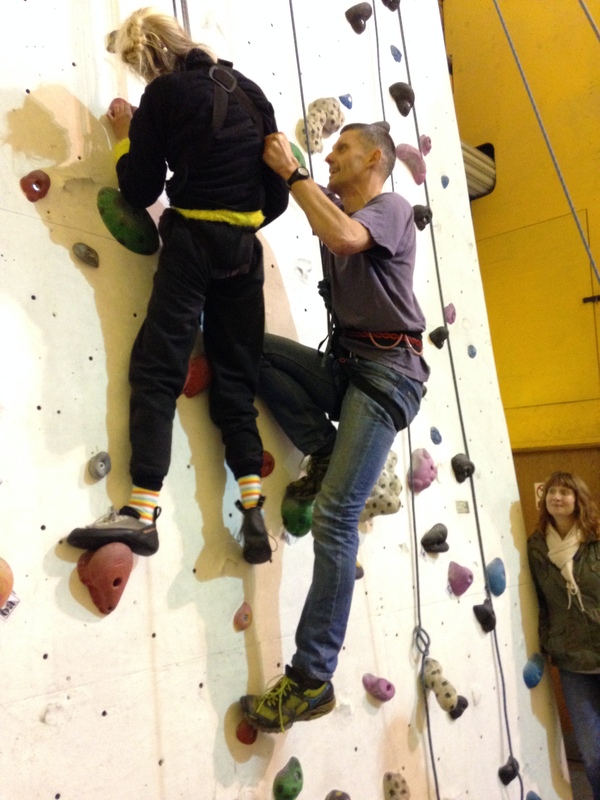 He suggests the first climb without the helmet. See whether Clare is swinging round and actually needing it. Robin will try to assist Clare with posture. The vent. Hardly discussed! 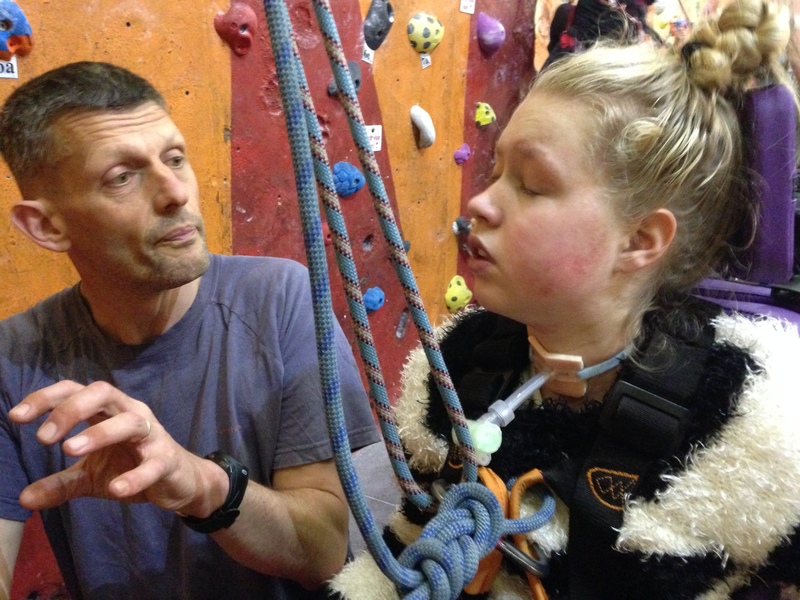 A month ago Clare did her only climb so far without it, and Robin carried it, ready to reconnect. But now … nah, leave it switched off on the back of the chair. Reconnecting it won’t solve problems fast enough, and Clare should come down if needing a rest. Nick and Helen point Robin to a sand bag to carry instead, tee hee. Today Clare wears a different pair of Hazel’s shoes, size 6 so a bit smaller: they seem to fit OK, but here the wall is a bit undercut and Clare’s feet don’t make much contact. It means swinging round is less of an issue. 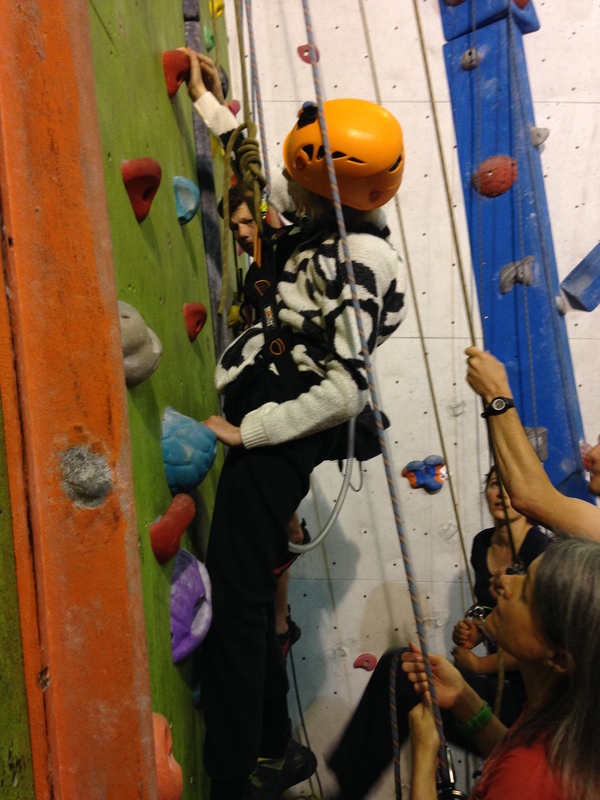 Clare reaches well with her hands and steadily scales up. 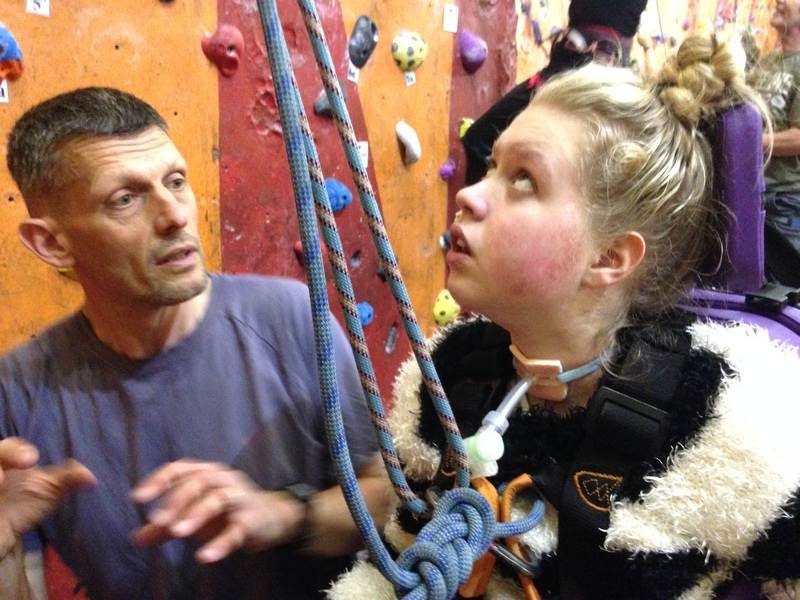 Robin is both checking when she wants to descend and encouraging her upwards. She still looks good when she comes down and Nick offers her advice on tactics for the next climb. He suggests to all of us that she should get up the undercut start fairly quickly (so Nick & I should pull hard) and then she can use her feet at the more vertical zone. Robin (with his ultra short pre-holiday day) has climbed up and down by now, and we hear about his new bike … keenly awaited… in the meantime he’s stripping down and cleaning the old bike, and planning a long canoeing trip in Germany. 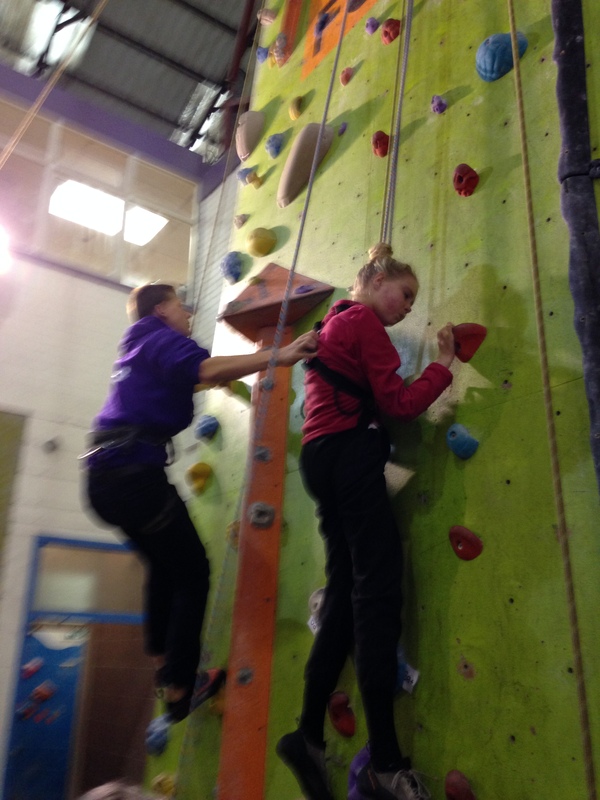 Climb 2: Clare keeps on reaching. 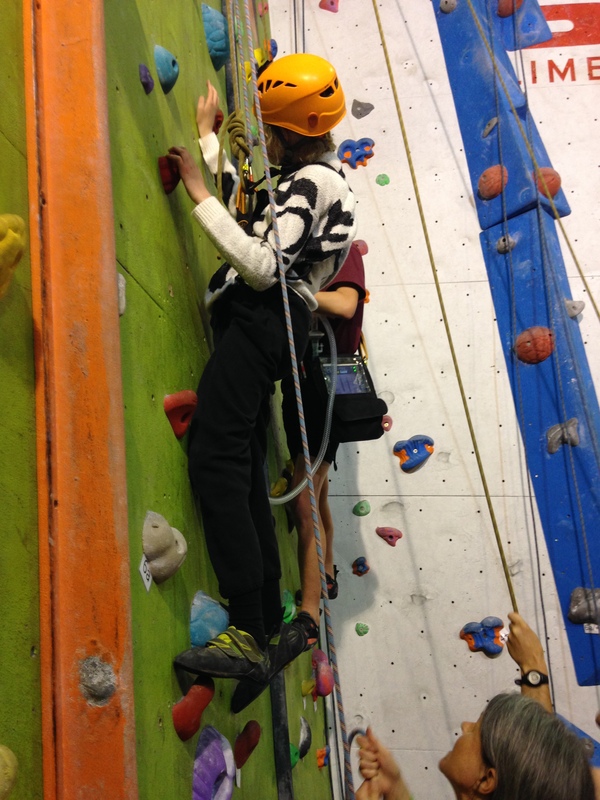 She is dangling at times but her arms (and all of our arms) are helping her up the overhang. 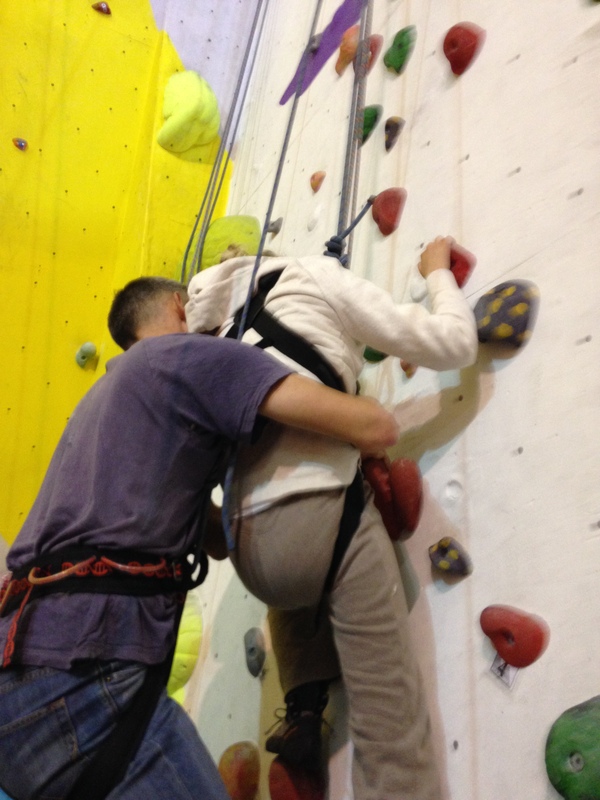 Robin climbs behind to push her to the wall. I can’t really see Clare’s face but while her head looks firm and she keeps making an effort to reach, I have to assume she is OK.
Then fairly suddenly, her head starts to hang further back and she doesn’t lift her arms forward and up. She needs to come down. She looks exhausted on arrival. Nick says it was a 7-minute effort, the longest yet. I suction airways and put on the probe, which gives a lowish reading. 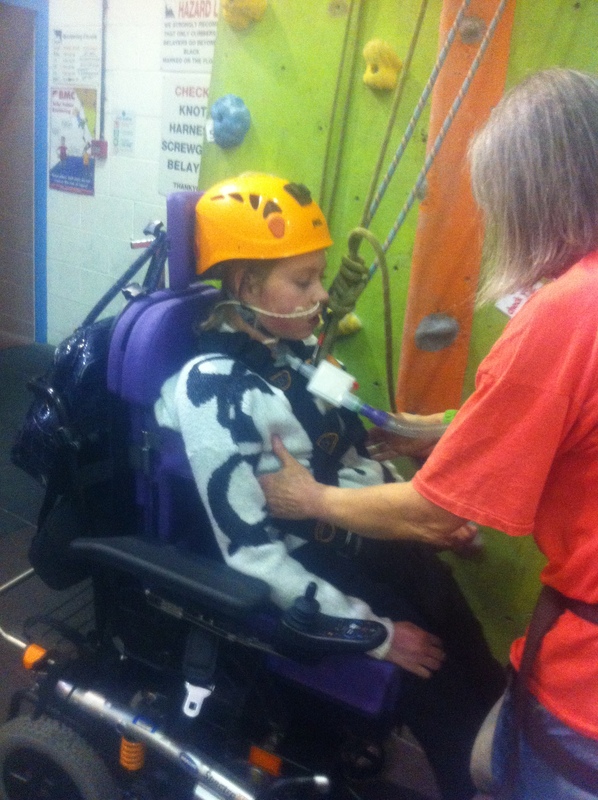 I tell Clare to breathe up as she can reoxygenate herself faster on her own than wait for the vent at modest pressures to do the job. Sats starts to rise and then I connect the vent so she can really rest. Helen goes for coffees and we talk holidays. Helen will be taking people kayaking (happy smiles, there’s just no staying away). Nick and Robin and family have 2 weeks in France and lots of cycling, and after that Clare and I and family have a week in Oxfordshire … after that there might just be time for a climb before Nick’s ‘Tour De Party’ when Nick gets launched on the road to Ultra Trail du Mont Blanc with the help of a charity cake bake by Robin and sisters. We watch Helen leading a ‘5c’. Clare is looking a bit better by now but hasn’t been cheerful enough to join in talk of the holidays, saying only that she is going to sleep when she gets home. Then she manages a smile when someone who saw her here at The Foundry early on comes over to say “Hi” and to congratulate her on her ongoing success. 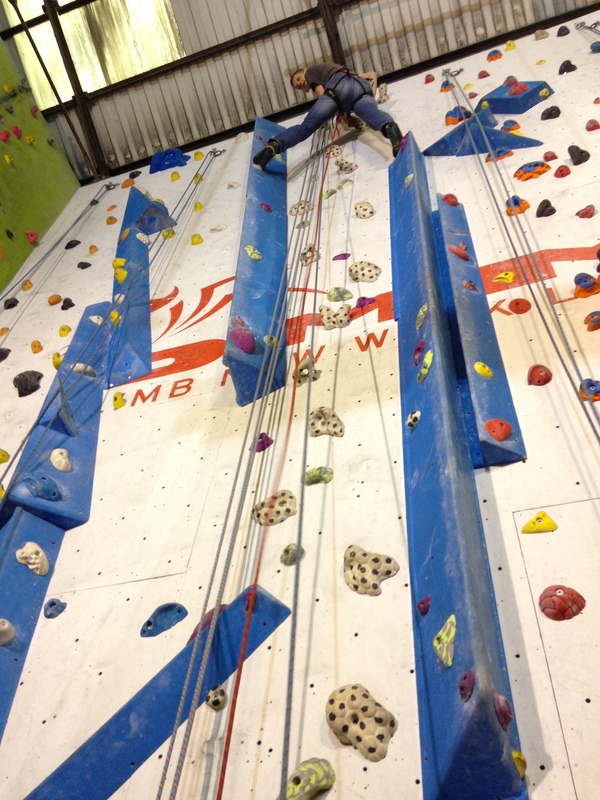 Helen waves from the top – she’s fixing the ropes. It’s been 5 weeks, and some things are different. Nick has stubble and Robin’s Y10 GCSE results are in. The stubble is protection from the mountain elements. Wet weather is expected in the French Alps at the weekend but Nick is undaunted, travelling out there tomorrow. We give him a cake baked by Clare’s sister, Xan, and a couple of choc bars (carbo loading / recovery / comfort). Holiday anecdote: it was “hilarious”, says Robin, his dad’s biking accident. Apparently French bikes have front and rear brakes on the other handlebars compared to British bikes …Nick braked sharply at bottom of hill and flew over handlebars. “Leg was bruised black!” agrees Nick cheerfully. Oh yes, he confirms, still OK for the 100-mile Ultra Trail run. Can’t match the bike stunt, but Clare had her own slightly spectacular crash, when the power chair spun off the road on a country lane and she plunged down into a hedgerow. No damage, luckily, except hair leafage and nettle rash. 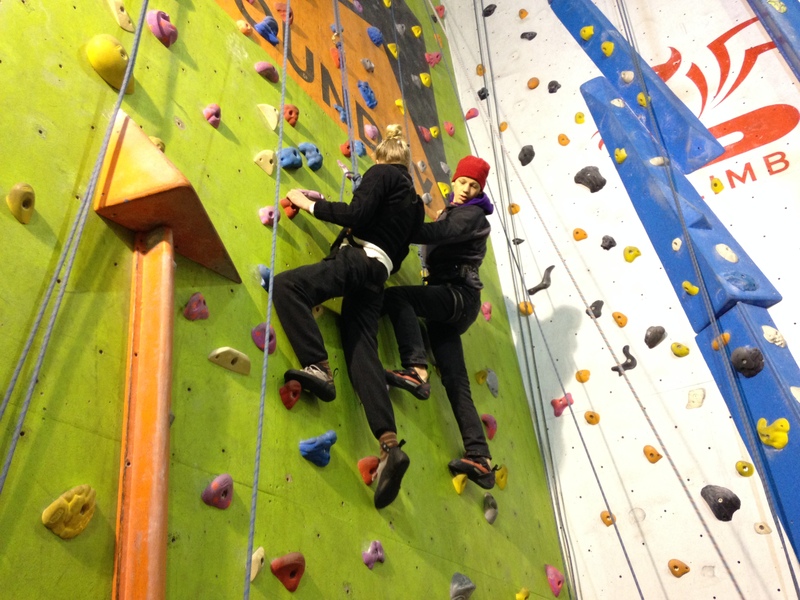 So, now for some climbing. 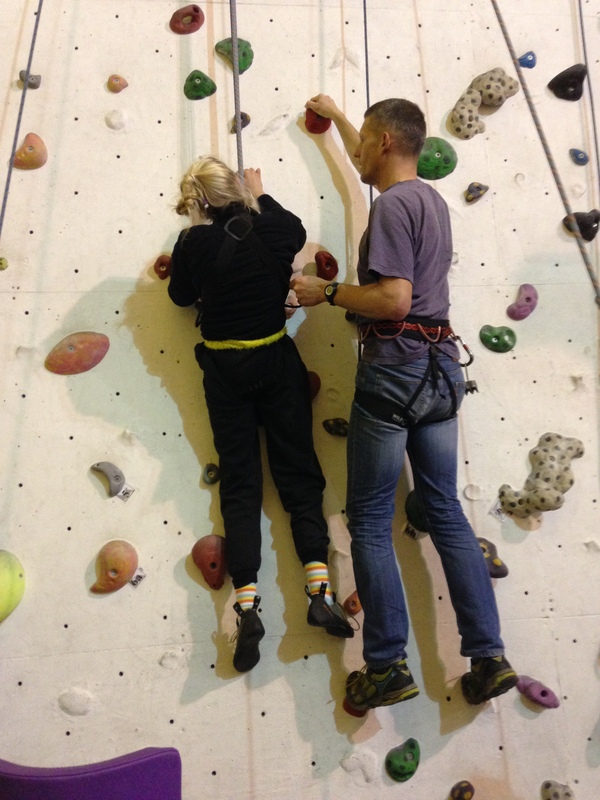 We’re at the same place as 3 climbs ago, but this time Robin climbs to Clare’s left rather than beyond the “liquorice”. 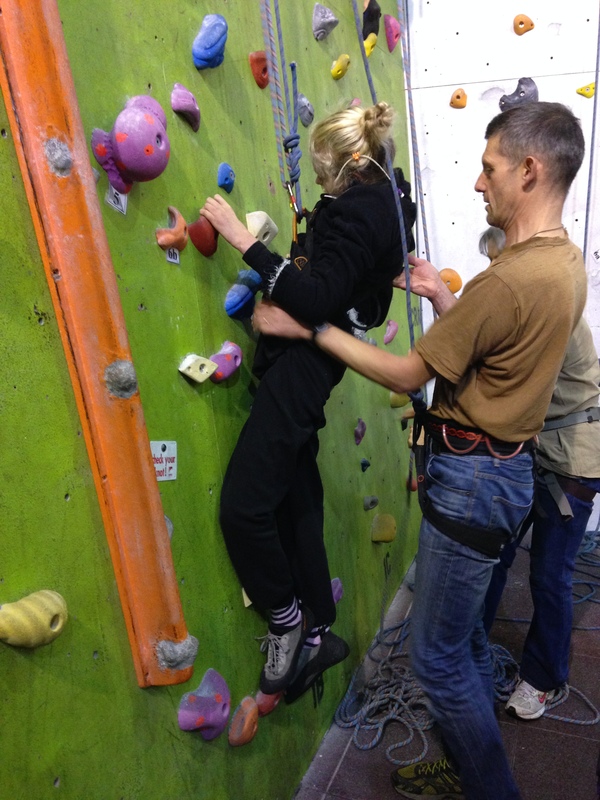 Clare wears Hazel’s grey climbing shoes, as used last time, and the strategy is to get hands and feet on the wall and to hold body out from wall. Clare is saying “thank you” a lot. She really is going to get speech back. Nick suggests Clare tries without a helmet at first, and we’ll see if she needs one. A very lightweight helmet would be good … what kind could we get? Helen and I think that French white water canoeing helmets are very light, and Helen says she’ll see if she can find one around. First climb. Clare is reaching well. She draws up both feet and uses them a bit, with help. 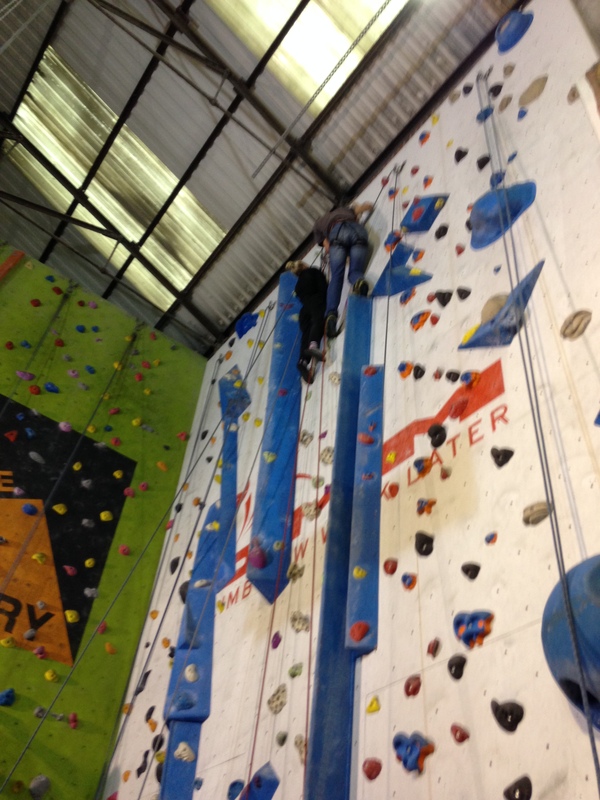 It’s the most “whole body” climb I’ve seen Clare do. I wonder if Clare is breathing. I call her name, and ask. She nods. Robin says she’s OK. The speaking valve falls off and I catch it one-handed. It isn’t essential but Robin has no trouble reaching down for it and fitting it back on. Nick and Helen discuss Clare’s technique. Clare is using her stomach muscles. Though not under command for a year or so, they are still there. 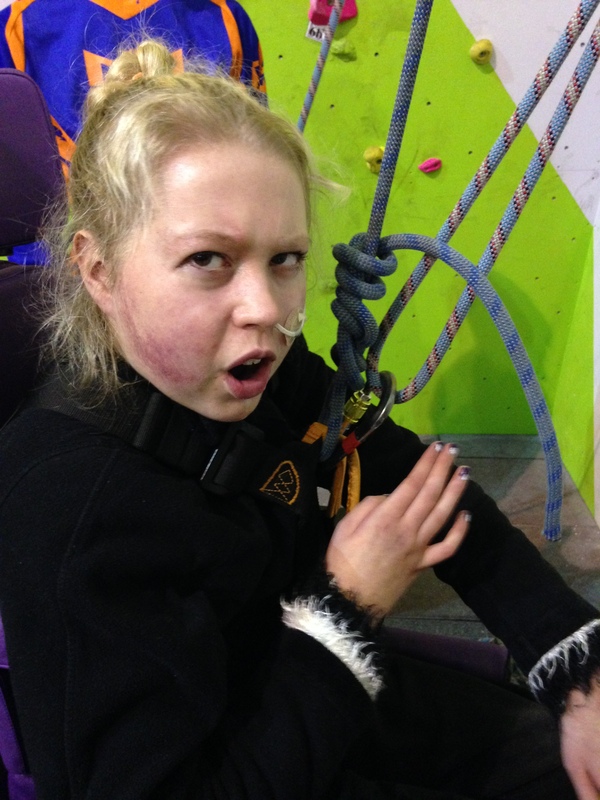 Clare used to be able to swing up onto a trapeze bar, I say. Clare’s next remark is harder to figure out. 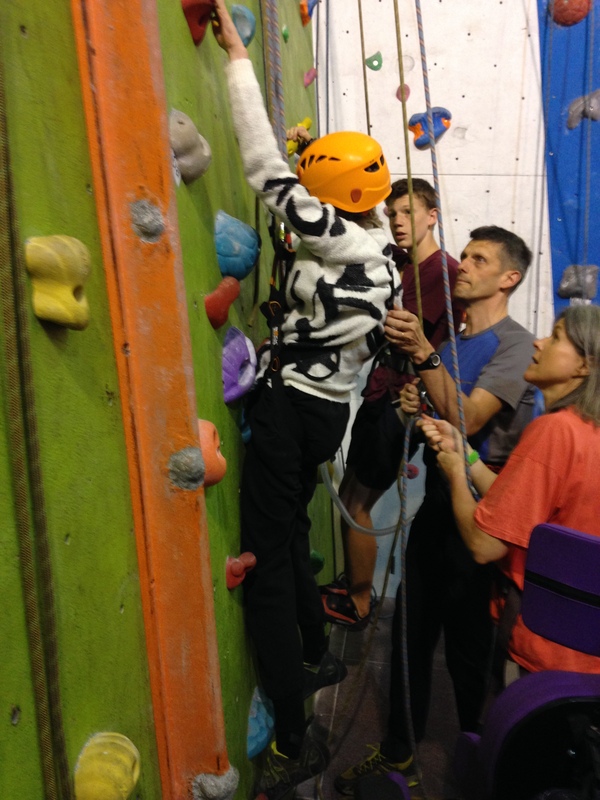 I thought she said “I am going to climb again [after resting]”, but it turns out to be “I am really going to learn to climb again”, i.e. 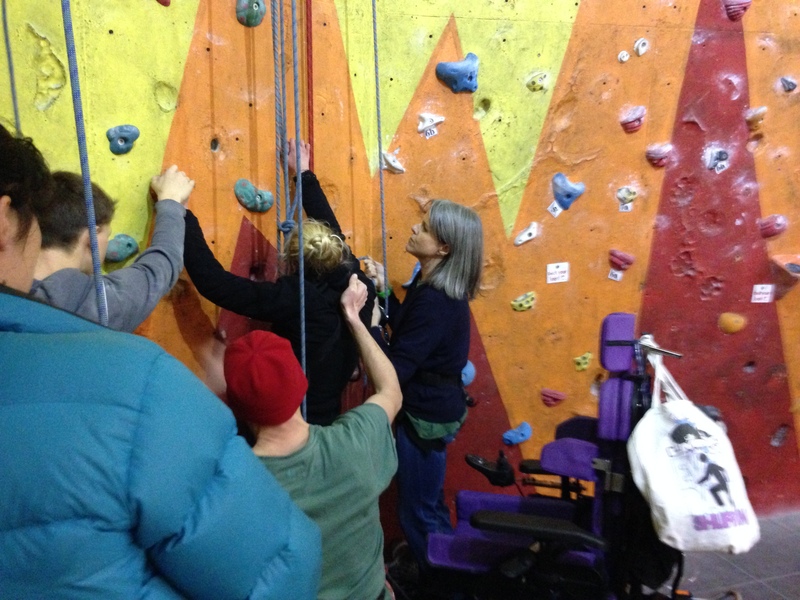 to get my ability to climb restored after my stroke. Clare says “Congratulations on your GCSE’s” to Robin. She is really looking forward to going back to school. She prefers school to holidays. Robin is the other way round. 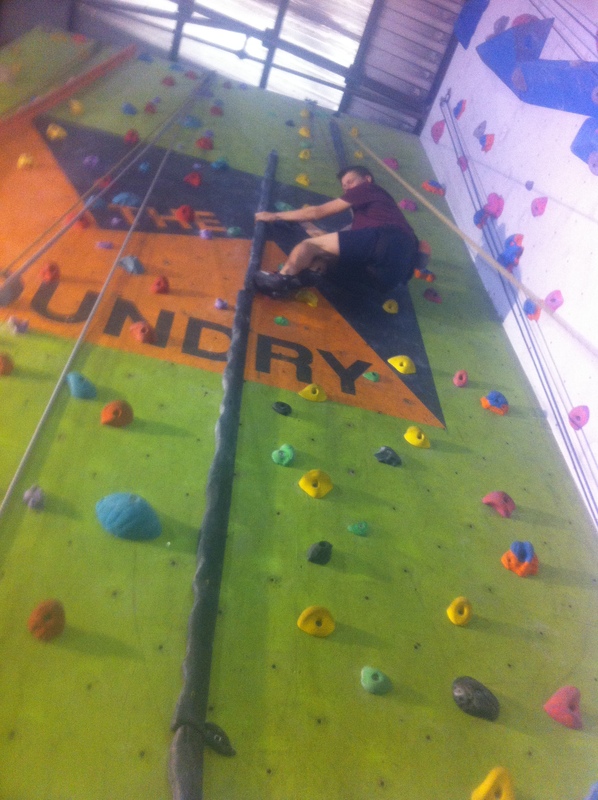 2nd climb. 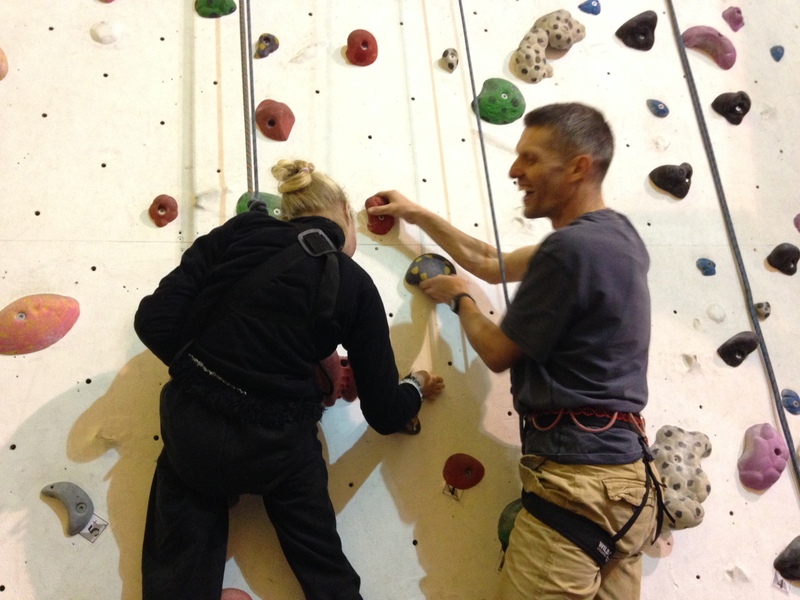 Nick climbs with Clare. Helen belays Clare, and Robin belays Nick. It’s all change (though I keep pulling). 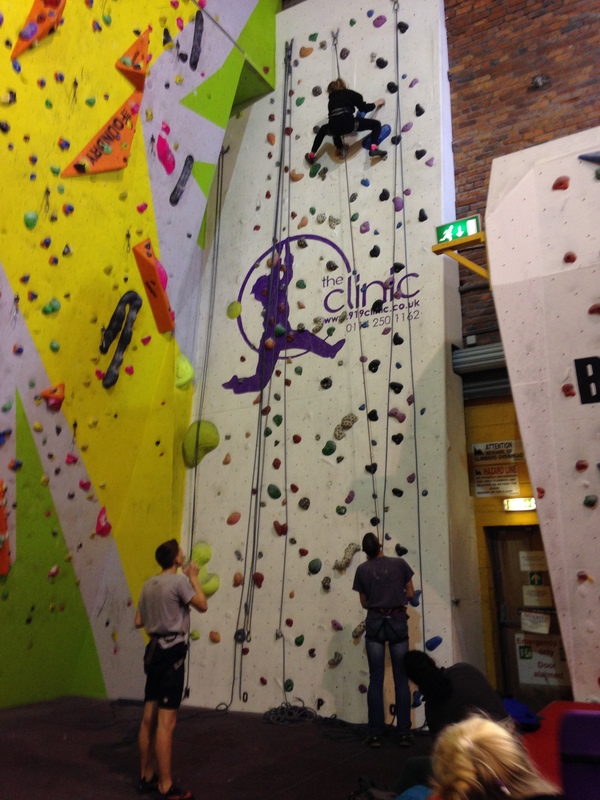 Clare gets almost as high with an all-over-body effort. She comes down tired, though still cheerful. 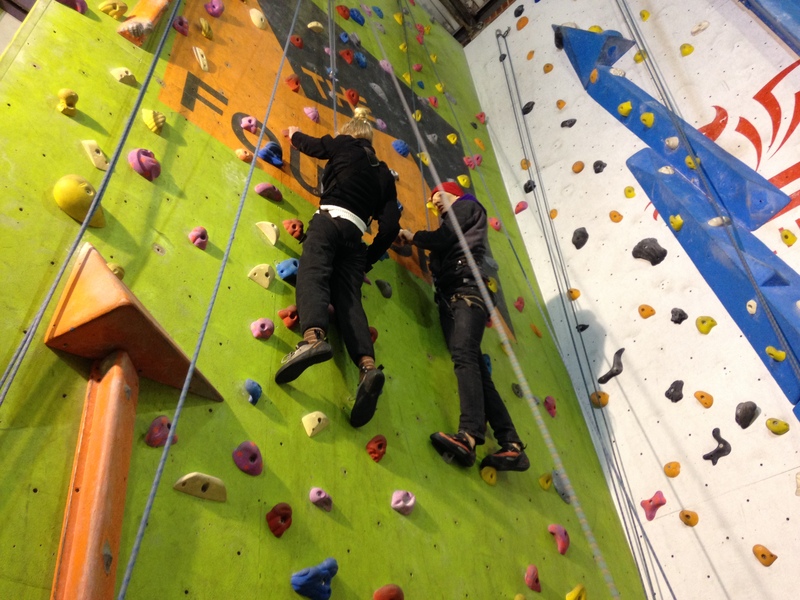 Nick says it’s usually Robin saying “climb to the top” but actually he thinks himself that Clare could do it. We fix the next climb for 14th September, fitting round Helen’s busy weekends. We wish Nick good luck for the UMTB, drink coffee, and eat Xan’s cake. Now September. Ultra Trail du Mont Blanc is in the past, just about. We followed Nick via the LiveTrail SMS update service … for 82 kilometres of dark and steep mountain running, until medics told him to retire. We meet Robin at the entrance. How’s the bike? “Excellent!” says Robin, huge smile. We look for Nick and Helen as we enter the main hall and see them setting up at The Slab. We look particularly at Nick as we approach …. thinner? Yes! Certainly is. Nick says he was 8kg lighter when weighed by the race medics, severely dehydrated. He’s grinning about that. He was extremely disappointed to be forced to stop – though he knew it was the decision that had to be made after throwing up from 8pm onwards all night and next day. But he’s pleased that people are still giving him sponsorship money to benefit the schools. Clare and I have studied the results and tell Nick he would have been well-placed (exactly 1000th) if he’d not been forced to stop. 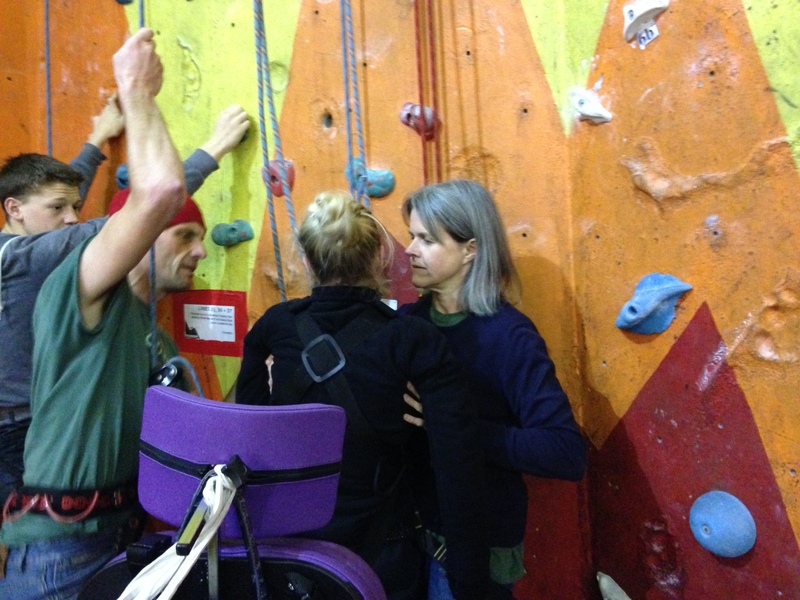 Nick will climb behind Clare again, with Helen belaying Clare, and Robin belaying Nick. It’s a great start. I pass Robin the iPhone once Clare and Nick are round the 1st blob and he gets some good pictures. 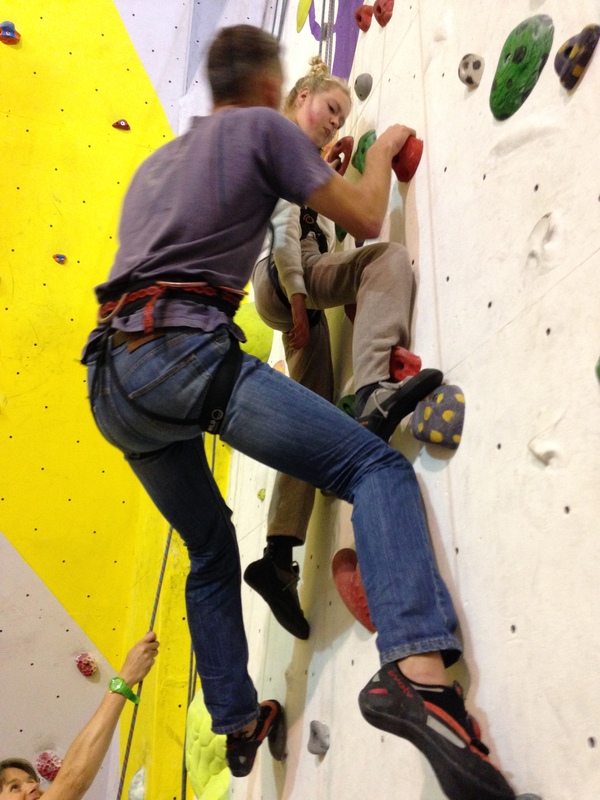 Feet on holds, and straightening legs – Nick encouraging and helping. 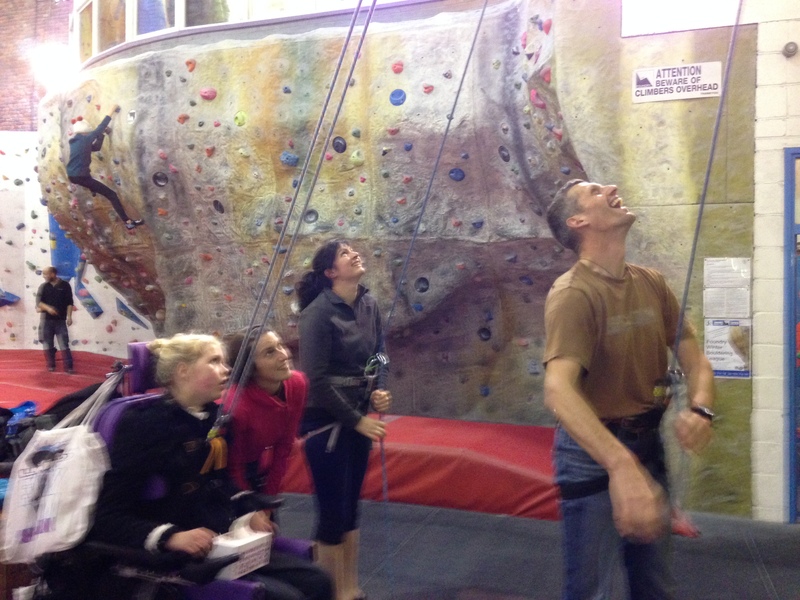 Something of a whoop from Helen as Clare gives a huge pull and Helen and I have our ropes go slack. Clare pulled harder or sooner than we expected, or she pushed up with her legs. Nick is saying go for top. Not very far from top … but Clare wants to descend. Nick asks how tired on a scale of 1 to 10. Clare says “7 plus”. I’m thinking that Nick stops moving at 10. On the other hand, Clare ought to stop moving before oxygen debt builds up. 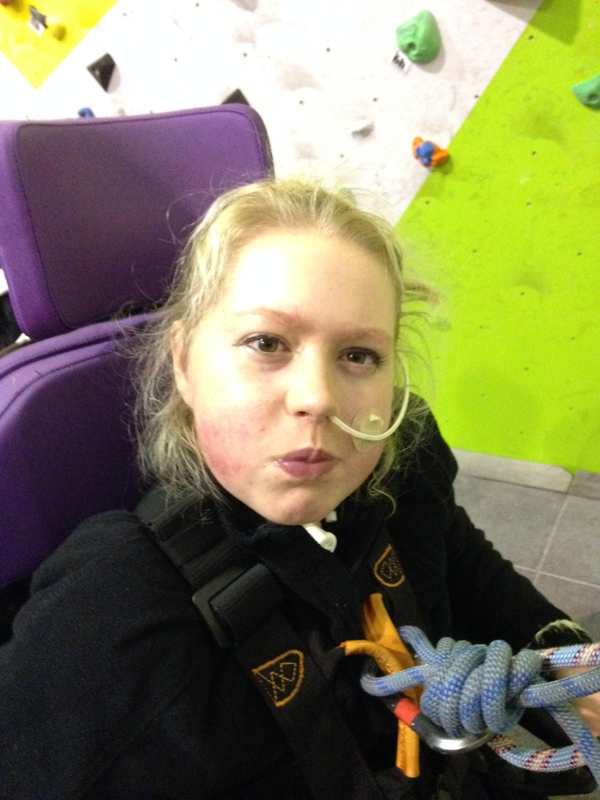 Clare now says: “I want to work on my weight training”. Well, we have just bought a pull bar to put up in doorways. Robin gives us advice. Tell people not to leap at it and swing into the room. Erm, ok then. 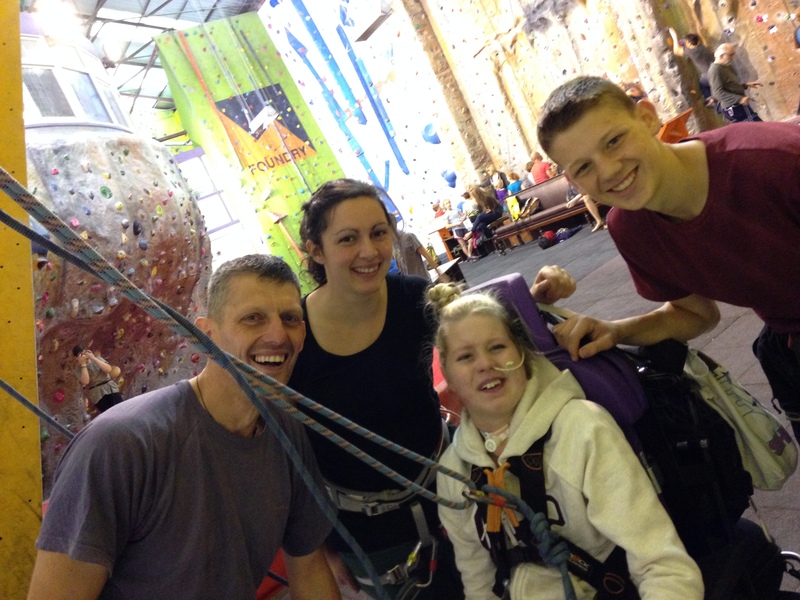 While Clare rests we hear about Robin’s planned 4-hour bike ride to follow climbing today. He is building up to a ride from John O’Groats to Cornwall. Or any excuse for a 4-hour bike ride. 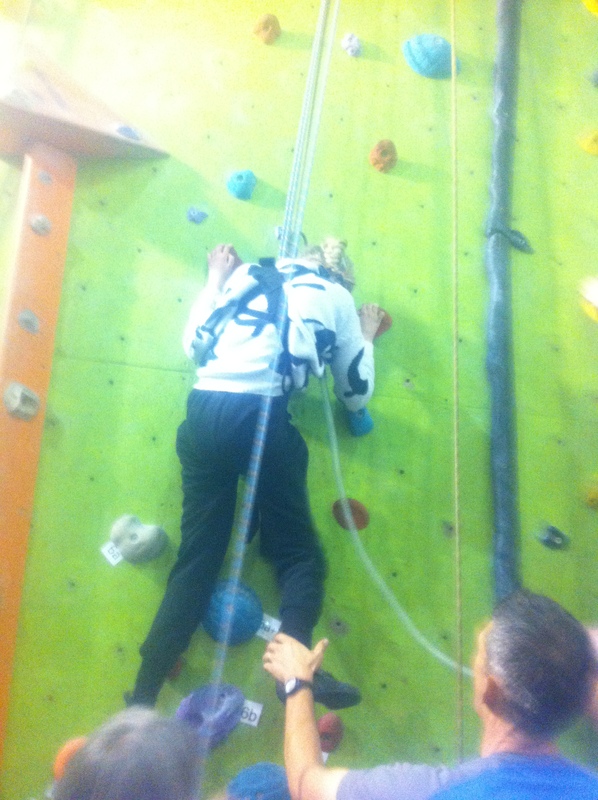 2nd climb. Went much higher than any of expected. Clare is trying really hard. There is some “1 more pull!” going on … 1 more pull is followed by another 1 more pull. It’s Robin, watching from below, who says Clare should come down. I’m just thinking that her hand positioning is looking less lively when Robin says she is “looking pale”. 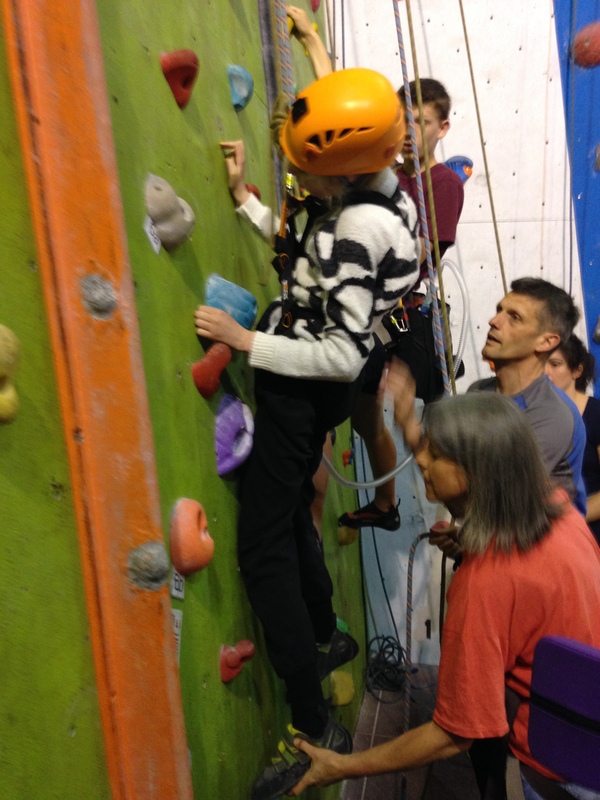 Now for some spectating: Robin climbs up a chimney route to get the ropes down. Meanwhile Helen fetches coffees, including a frothy one for me and Clare to share. And cake for Nick, to try to feed him up a bit again.